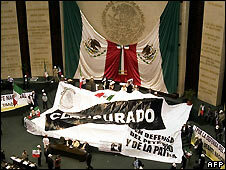 Opposition legislators in Mexico stormed the podiums in both houses of congress, in opposition to plans to reform the country's oil industry. Sessions in both chambers were suspended as leftist politicians shouted "the country is not for sale". President Felipe Calderon's energy reform bill would allow foreign companies to invest in Mexico's state oil company (Pemex) to boost output. Opponents say that would mean handing over control and profits to foreigners. Mexico's known oil reserves are running out and production has been falling. Deputies and senators from the Party of the Democratic Revolution (PRD) took over the podiums in both houses. Some wore oil workers' hard hats as they unfurled banners and shouted slogans accusing President Calderon of trying to privatise Pemex, a national symbol that has been in state hands since 1938. Mexico's constitution stipulates that the oil industry must remain under state control and suggestions of allowing more private involvement have provoked a strong reaction among some sectors. Mr Calderon wants congressional approval for his reform bill which he says would give Pemex more freedom to manage its budget and contract out work, so boosting both oil production and exploration. Oil revenues constitute some 40% of federal income, but production has been falling. Mr Calderon's conservative party lacks a majority in congress, but may be able to push the reform through with the help of the opposition Institutional Revolutionary Party.